If you are taking supplemental lysine and suffer an infection that requires antibiotics, be sure to inform your doctor about your supplement use before starting your medication; using lysine and certain antibiotics can be dangerous. Both lysine and antibiotics also may cause side effects. The U.S. Food and Drug Administration, or FDA, regulates antibiotics and other medications, but the FDA does not regulate or approve any lysine supplement. Lysine is an essential amino acid, which means your body can't make it and you have to get it from food. It helps your body produce carnitine, a nutrient that converts fatty acids into energy and helps lower your cholesterol. It also appears to help your body absorb calcium and form collagen. Taking supplemental lysine may help stop cold sore outbreaks and outbreaks of genital herpes and may help prevent osteoporosis. However, as of 2011 such benefits are still theoretical, according to University of Maryland Medical Center. Antibiotics fight bacterial and fungal infections in your body. There are numerous types of antibiotics, and not all target the same bacteria or fungi. 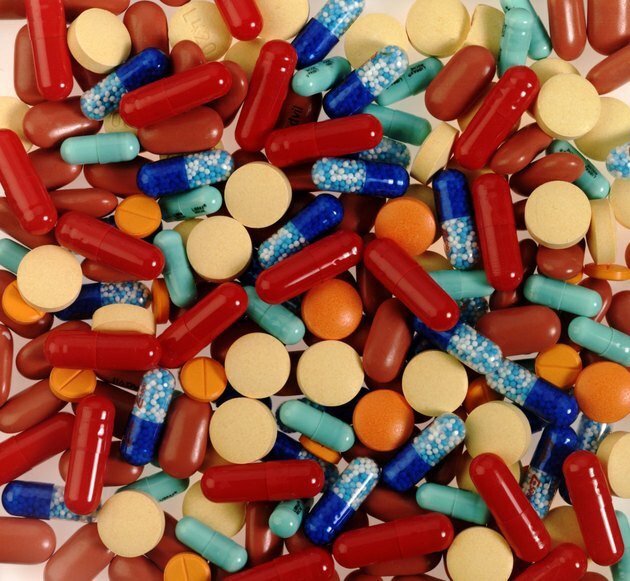 Types of antibiotics include aminoglycosides, typically used to combat gram-negative bacteria like Escherichia coli; carbapenems, used to combat sepsis, gangrene, pneumonia and abdominal and urinary infections; cephalosporins, used for soft-tissue and skin infections and respiratory infections; fluoroquinolones, used against bacterial infections; glycylcyclines, used against complicated infections like Staphylococcus aureus resistant to methicillin; and macrolides, used for streptococcal infections, respiratory infections, syphilis and Lyme disease. Other antibiotics include penicillins, used for a wide range of infections; sulfonamides, used for urinary tract infections; polypeptides, used for eye, skin, ear and bladder infections; and tetracyclines, used for sexually transmitted diseases and Lyme disease. Consuming lysine supplements and certain antibiotics may increase the level of these drugs in your body, making them toxic, according to the website Drugs.com. These include aminoglycoside antibiotics such as gentamicin, amikacin, tobramycin, kanamycin, netilmicin, netilmicin, streptomycin, tobramycin and neomycin. If you are using any of these antibiotics, you may not be able to take lysine or your doctor may need to adjust dosages of your medication or supplement. Consult a doctor before combining lysine and antibiotics. Possible side effects caused by aminoglycoside antibiotics include kidney damage, dizziness and hearing loss. If you have kidney or liver disease, you need to consult a doctor and use lysine supplements with caution. Lysine also may cause an allergic reaction. While lysine in the diet is generally considered safe, high amounts may cause gallstones, according to University of Maryland Medical Center. Consult a doctor about any dietary restrictions, such as avoiding large amounts of lysine-containing foods, if you are using aminoglycoside antibiotics. This amino acid is usually prevalent in protein-rich foods such as meat, cheese, nuts and soy. Spirulina and fenugreek, two common dietary supplements, also contain lysine; consult a physician before taking either with antibiotics.